Slice the chicken breasts to squares. Mix the olive oil lemon juice salt pepper cumin and curcuma and pour the mixture over the chicken breasts. Leave the mixture in the fridge for at least an hour. Then slice the bacon and onion to peaces. 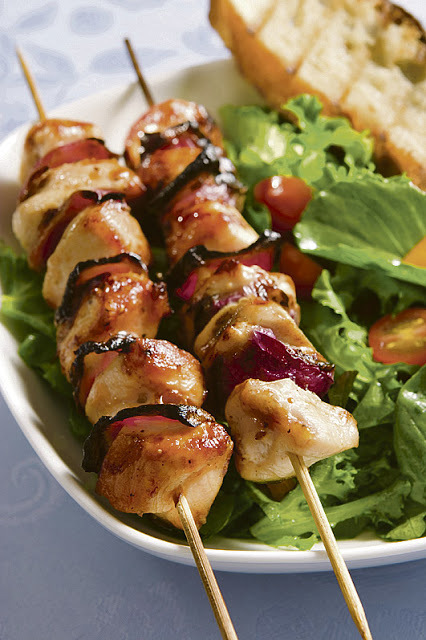 Put the chicken, onion bacon and then cherry tomatoes to wooden sticks to make kebabs. Grill the kebabs for approx. 20 minutes until they get nice brown color.